The top seeds may be the event “favorites” for the Outdoor Heps middle distance titles, but given how tactical these races have been the last few years, the titles could go to anyone in the field. Brown senior Ned Willig is looking to claim one more individual Heps title (he previously won the Indoor Heps 1,000m title as a freshman) before graduating this year. He has yet to win an Outdoor Heps title, but then again, he’s only competed at one previous Outdoor Heps championship – last year, he was fourth in the 1,500m and was a part of the runner-up 4×800 relay. Going into this weekend, Willig has the best 800m time in the conference and we anticipate he will focus on that event. Brown could get additional team points from the Indoor Heps 500m champ Zach Emrich, who has the third best time in the conference so far this season. A pair of rookies join Willig and Emrich as being the only athletes to run sub-1:50 so far this season: Harvard’s Myles Marshall and Columbia’s Alek Sauer. Both freshmen scored at Indoor Heps in the 800m: Sauer was the Indoor Heps 800m runner-up, while Marshall came back from falling on the first lap to finish in sixth. We feel there could still be quite a Light Blue presence in the 800m final, especially after Columbia broke the conference record in the 4×800 relay at the Penn Relays with rookies Josiah Langstaff and Sam Ritz and junior Rob Napolitano. Penn can also score a lot of team points in this event with Elias Gracas, Jeff Wiseman, and Drew Magha in the mix. Princeton’s Josh Ingalls – the 2016 Indoor Heps champion in this event – has only competed in the 4×800 since the end of March. Yale junior James Randon is in search of his first Heps title this weekend. He’s improved both his 1,500m and 800m times by 3 seconds this year, resulting in the top 1500m time of the season and a top 10 ranking in the 800m. 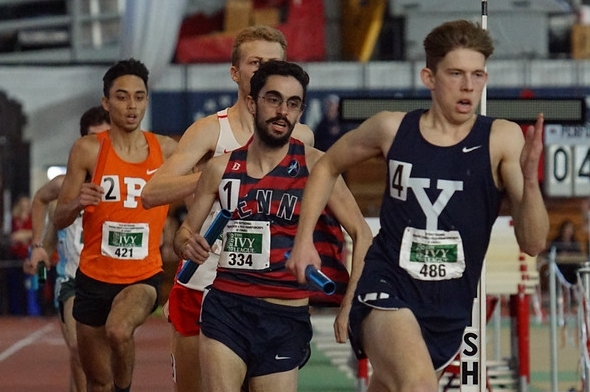 He has wheels – he pushed Penn’s Thomas Awad to the line in the Indoor Heps DMR but Awad outleaned him by 0.01 seconds. But you will NEED the wheels to keep up with Awad – he won the 1,500m and 5,000m at Outdoor Heps last year and the Penn Relays 4xMile this year with that last gear. Princeton’s Garrett O’Toole and Noah Kauppila also have strong finishes as they used their strong kicks to get All-Ivy honors during this past Indoor Heps championships (O’Toole – 2nd in the mile; Kauppila – won the 1000m). Cornell’s James Gowans and Columbia’s Napolitano are also sub-4 milers and can be in contention for either the 800m or 1500m titles. Both men made the NCAA Indoor Championship cut for the mile this past year. Other runners to consider as possible finalists include Penn’s Chris Hatler, Cornell’s Mark Tedder, and Dartmouth’s Tim Gorman. This entry was posted on Tuesday, May 3rd, 2016 at 7:00 am. It is filed under Heps Champs, Men, Spotlight, Team Previews. You can follow any responses to this entry through the RSS 2.0 feed.